"Isabelle Thornton" Le Chateau des Fleurs: Smartphone DNA Release! 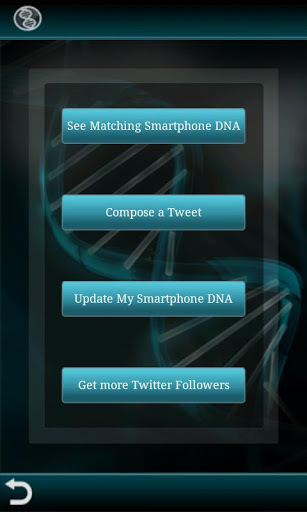 I am soooo excited to announce the release of the Smartphone DNA app for Android. I am a Twitter junkie and this app is the coolest new app for Twitter users. The app lets you create your Smartphone DNA and then compare it against other Twitter users to see how close you match. 1. Smartphone DNA shows you a list of apps you have currently installed. 2. You select the apps you want to share as part of your DNA. 3. Smartphone DNA shows you how close you match the DNA of other users. Smartphone DNA is 100% secure and completely controlled by you. You spend more time with your smartphone than with your spouse, girlfriend, boyfriend, family, friends or coworkers. You sleep with it, eat with it, watch TV with it and admit it; you take it to the bathroom. By doing this, you are creating a new type of Smartphone DNA. 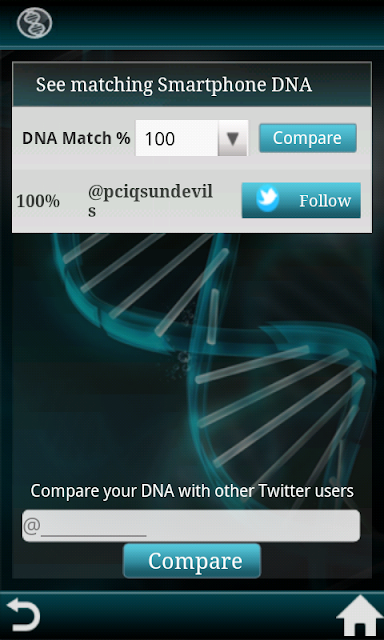 Smartphone DNA helps you find other Twitter users that match your Smartphone DNA! Sign up for the Smartphone DNA Newsletter and learn the most effective methods to get new Twitter followers. I will soon be getting a smartphone. Wow its looks great app! Unbeliveable, this is incredibly great ..
Its looks great app!Very interesting ! I downloaded it but I don't really know how to use xD I have to look into it more carefully! !